Shock Top is totally a little colt for real. Shock finds Emerald Jewel at the park and makes friends. He then asks Emerald to come over to his house for snacks. Once Emerald is captured by Shock's "parents", he returns to his real form, a strong stallion. Once the mare leaves, Emerald tricks Shock and the other stallion into thinking there's treasure nearby. Shock is left alone with Emerald while the other one looks for it. Mere moments later, Emerald vanishes. Shock Top back in his foal form, attends the Ponycare fundraiser party in the hopes of kidnapping two foals. He meets an oddly familiar looking blue filly who suddenly has to leave. Getting back to work enthralling these two foals with him, things are going great. 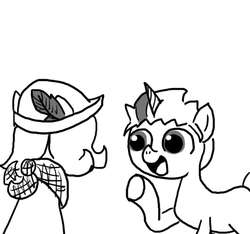 But then suddenly some WSDF pony comes up asking questions, things about his parents and such. Things start to look bad and Shock Top can't answer, so he gets really defensive. More guards arrive. Shock Top is interrogated and taken away. Emerald Jewel, a hostage held for ransom, until he escaped.